Cream butter with sugar. Add the vanilla extract and mix. In a separate bowl, mix the flour, baking powder, and salt. Add these dry ingredients to the butter/sugar/vanilla mixture. Mix. Gather the dough in a ball and split in two. Place one of the halves between two sheets of plastic wrap. Cover the other half and set aside. Use a rolling pin to flatten the dough to 1 cm thick. 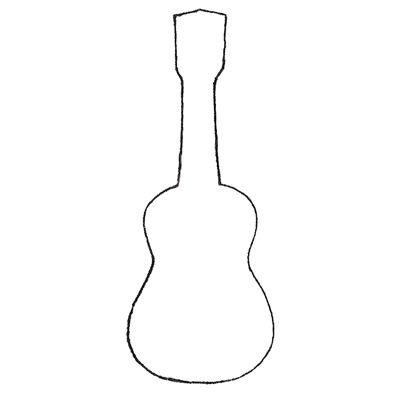 Print out one of the ukulele stencils (for stencil 2, use only the body stencil, leave the head/neck stencil for later), cut it out, then spray with nonstick spray (so the paper won't stick to the dough). Use a knife to trace out the stencil on the dough. Carefully move the dough cut-outs to a parchment-lined baking sheet. 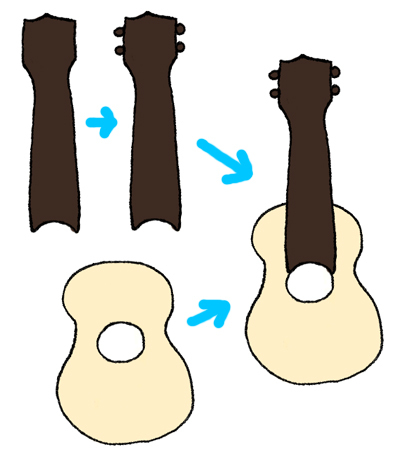 Take the pearl milk tea straw and cut out holes in the cut-outs where the ukulele sound hole should be. Repeat all of this with the other half of the dough. Gather the leftover scraps and repeat until all the dough is shaped. Refrigerate cookie cut-outs for 30 minutes. Preheat oven to 350°F. When the half hour is up, place in oven and bake 10-12 minutes, until the edges begin to brown. Take out of the oven and let cool on tray. Make sure cookies are totally cool before decorating them. I have two different methods for decorating the cookies. One takes less hassle, but in my opinion, doesn't look as good (but it's also less fragile). This is method 1, shown in the first photo in this post, which uses stencil 1. 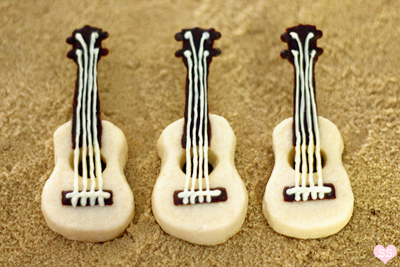 The other method takes more work and produces a more fragile cookie, but I think it looks more ukulele-like. That one is method 2, shown in the last photo in this post, which uses stencil 2. Pick whichever method you would prefer. To use the stencils, copy and paste the one you want onto MS Word (or similar program). Crop out the extra background and stretch the stencil out to the indicated dimensions. Measurements are taken at the extreme points of the stencils. So for the length of stencil 1, it would be from the pointy top to the round base. This step is fairly straightforward. Melt the semisweet chocolate. 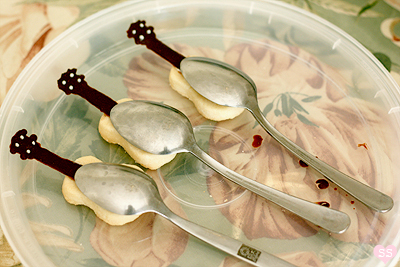 Use a toothpick or a spoon to spread it in the head and neck area of the cookie. Then, use a toothpick to trace out the bridge of the cookie. Melt a little bit of white chocolate and use a toothpick and make four dots in the head area. Let dry before proceeding to the string step. Take the head/neck part of the stencil and cut it out. Place a piece of parchment paper on a flat, clean surface and trace the stencil onto the paper over and over. Flip the parchment over. Melt the semisweet chocolate. Use a toothpick or a spoon to spread it within each outline on the parchment. Try to make the chocolate layer thick. Wait for it to dry. Take a toothpick and dot on four dots of chocolate at the head to make tuners. Cover each chocolate tracing with another layer of chocolate and let dry. Melt a little bit of white chocolate and use a toothpick and make four dots in the head area. While waiting, use a toothpick to trace out the bridge on the cookie bodies. When the chocolate on the parchment is totally dry, carefully remove the chocolate head/necks from the parchment paper. Melt some more semisweet chocolate. Dab a bit of chocolate in the top center of each cookie body, above the sound hole. Place a chocolate head/neck on top of the chocolate blob and use a spoon to hold the neck in place until the chocolate blob is dry and holds the chocolate pieces in place, seen in the photo above. This step is the same for both methods. 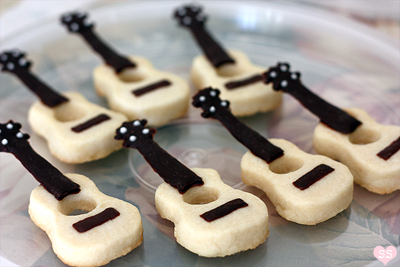 Cut out little rectangles of parchment paper that fit over the ukulele cookie sound holes. 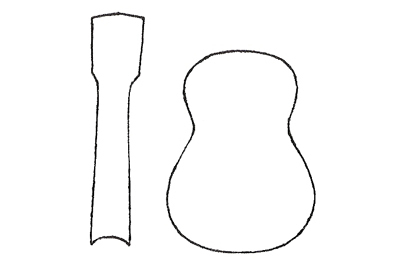 Cover the sound hole of each cookie, as seen in the photo above. Melt white chocolate and place it in a piping bag. Cut a tiny hole in the piping bag and test drawing lines on a piece of parchment. 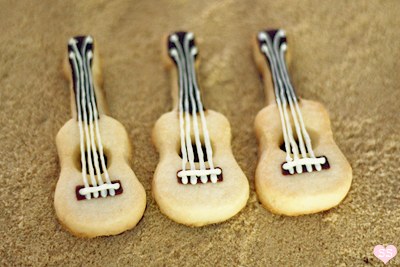 When ready, pipe four strings on each cookie. Start with the middle two strings, piping from the bottom of the bridge to the top two white chocolate dots on the head. For the outer two strings, start from the bridge bottom and pipe to the bottom two white chocolate dots on the head. Trace over the four strings again with white chocolate to strengthen them. Then pipe a horizontal line of white chocolate across the bridge (over the four strings). Let the strings dry. Once the strings are totally dry, use a toothpick to carefully poke loose the small pieces of parchment paper, push them toward the back of the sound hole, and carefully use your fingers to pull out the piece of parchment from each cookie. To finish, the sound hole should be covered. Melt semisweet chocolate and use a spoon to place small blobs of it on a piece of parchment, seen in the photo above. Then place a cookie on top of each blob, let the chocolate dry, then carefully pull the cookies off the parchment. I'm in awe! These cookies are not only adorable- but also gorgeous and totally perfect (pig praise coming from a perfectionist like me!) LOVE them! Seriously CUTE! My husband plays the guitar, but really wants a ukulele, because it's just fun. I wanna make these for him! Me too! That is, that I want to play ukulele. I love small stringed instruments (I play viola and want to play mandolin, ukulele, banjo, and bass guitar, among many others... well maybe that one was a large stringed instrument). Posting from my phone while I'm sitting next to you! I love the ukelele. Especially in that one song somewhere over the rainbow! Miriam: Thank you! Yup, I'm a total perfectionist as well so yay! Julia: Thanks! The fact that ukuleles are fun is definitely why I like them so much. Tres Delicious: I think it's the colorful umbrellas :). Thank you! Julie: Thanks so much for the site suggestion! It looks awesome; I think I'll be spending a lot of time on it :D.
icefox: Ooh, the banjo sounds interesting as well. Too many skills to learn! 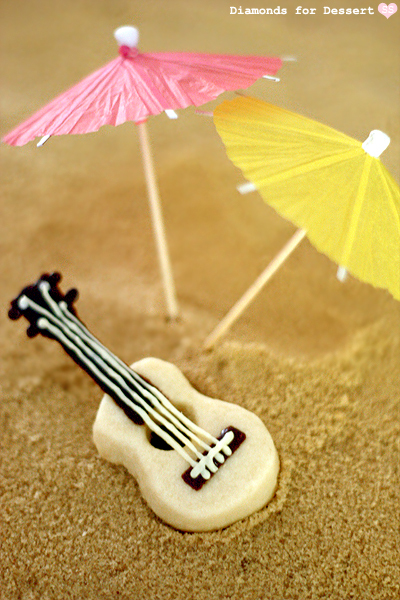 Hehe, the cupcake ukulele is cute/funny. Steph: Haha, I was wondering what you were typing :P. Ditto. "Somewhere over the rainbow" is an awesome song, especially because of the ukulele. 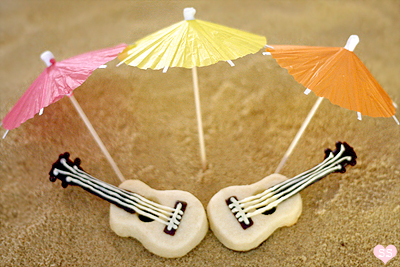 Ukuleles are totally fun and easy to use! I got one for my birthday this year and have just taught myself songs by going onto youtube and watching tutorials and covers of songs I like! You should go ahead and buy yourself a ukulele and learn to play. It's much easier to pick up than most instruments (lots easier than guitar) and fairly cheap! If nothing else it's gauranteed to put a smile on your face! I love mine! Really digging these cookies (found your site via cakeheadloves.wordpress.com) and am going to have to try and replicate them! Amazing! Oh my goodness! That. is. AMAZING! You are amazing! Cool! Join Ukulele Underground. They have online classes (recorded for $15 a month) and a wonderful forum. Get a decent starter uke and get going. I have only taken the classes on ukulele underground and taught myself from videos and internet stuff. 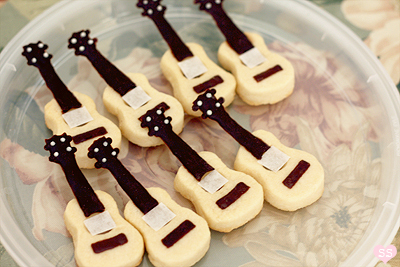 I have no music background at all..
Love the cookies, I will have to try this sometime! Anonymous: That sounds fun. I will look up some youtube tutorials :). ukulefty: Yay, glad to hear that. I'm definitely going to go for it! fitncrafty: I will check it out! Thanks for sharing :D.
Step 1: Get a ukulele. You can get a crappy one for $30 or an okay uke for $100 or a good ukulele for $200. They are the most affordable instrument today, so it makes sense to just buy one. Step 2: Choose a simple song to learn, a song that you enjoy singing. This is a step I emphasize even if you don't consider yourself a singer. Being able to sing along was important to my learning, and it might be for you, as well. Step 3: Practice it until satisfied! Step 4: Return to step 2 and repeat as necessary. I started learning the ukulele about two months ago. I had been reading about it until I just headed over to the Ukulele store here and bought one, a Kala Pineapple ukulele. There are many many cheap ukes, and I would recommend staying away from them, as they refuse to stay in tune. One good starter uke to test the waters is the Makala Dolphin. However, it would be worthwhile to invest a little more money and get something better to begin with, maybe something from Ohana. I thought myself as unmusical and tone deaf, and had read that the uke was fairly easy to learn- It is. Four strings and four fingers are all you need. In the last two months I've actually discovered that I'm not tone deaf, but do have to work on my rhythm, which I definitely did not have before. As with any instrument/skill, you do need to get practice in. At first, it will be exciting, especially since lots of the chord formations are fairly easy, but changing chords and strumming take some time to get down. It can be a bit frustrating after a while, but you'll get there. I'm still on the way, but I've enjoyed it from day one. Also, the uke is not just for Tropical Feeling. 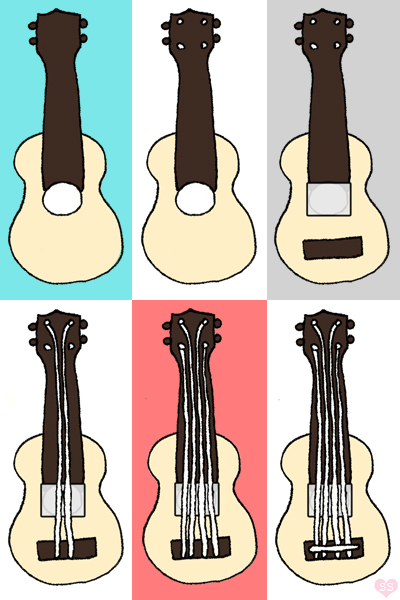 Artists like Jacob Borshard, Sophie Madeleine, and Jake Shimabukuro have really moved the uke beyond the realm of a tropical/folk instrument, and the Ukulele Orchestra of Great Britain have also brought the instrument into the present, away from its connotation as an instrument for 20s standards. Do pick one up, though. If you already dig it, you won't be disappointed. I'll end with saying that you are a master shortbread luthier! Nice work. Loving your 'yummy yooks' I would eat the lot! Yes take up the ukulele. My parents bought me one as a joke at Christmas and now I play in a ukulele orchestra and have so much fun. Any Makala/kala uke is cheap and cheerful, and will play really well. Best learning resource? 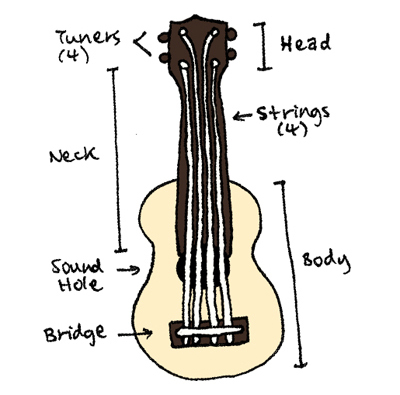 - 'ukulele for dummies'. Brilliant for beginner, takes you through step by step strumming, chords, notes, blues, jazz etc, and comes with a cd so you can hear what your playing is 'supposed' to sound like. These are the cutest little biscuits I've ever seen! Just discovered your blog via Poires au Chocolat and so pleased I did. Not sure I'm quite brave enough to attempt these cookies yet, but have put them on my (very long) wish list of recipes to make in the future! I started playing the ukulele about 2 and a half years ago. I LOVE IT! It was easy, it's portable and it's a heck of a lot of fun. I highly recommend learning to play. Man With Hat: Haha, thanks for that! I think I will do it. misterrios: Thank you for sharing your experiences and your detailed explanations. I will definitely You Tube all those artists you mentioned. zeph: Okay, totally going to get my hands on 'Ukulele for Dummies'. Thanks! Sue: Will do! Thanks for the info :D.
thelittleloaf: Thank you! Yes, the decorating is tricky, but I'm sure you'll get there! Sahara: Thank you for sharing! I'm definitely going to attempt to learn :). Thanks so much for this... so cute! 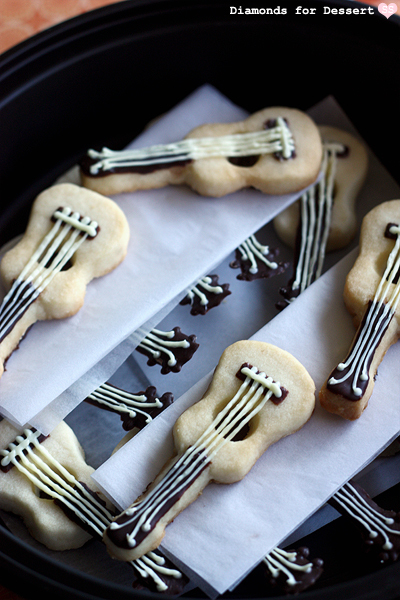 My husband and I, and most of our friends, are musicians and we're having a ukulele and other random instrument (Moogs, drum machines, accordions, banjos) jam and pot-luck dinner on Saturday night, so I'm going to attempt to make these biscuits for that. Hopefully I don't break too many of them in the decorating process. yearofthirty: Yay, I hope it turned out well. The random instrument jam sounds awesome. Thanks for the luck; I'll need it (I'm sadly very unmusical). I'm Evey: No prob! Practice and you'll definitely get there. These cookies are adorable (and delicious, I'm sure). A lot of work! 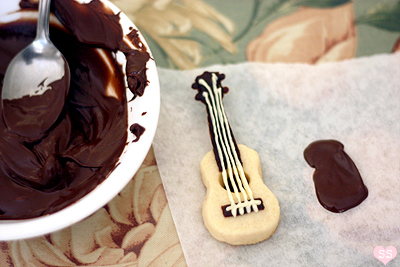 If you can create cookie art like this, you can play the ukulele. I got mine for Valentine's Day, and I play for hours at a time. Adore it! If you can get down chords: C, F, G, you can play for hours! Too much work for me. Do you sell them? You should! Probably would get a lot of business from all the 'ukulele groups out there. 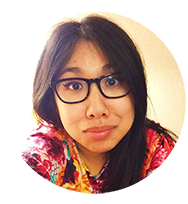 I belong to the Hawai'i State Society of Washington, D.C. 'Ukulele Hui. Been playing for over forty years. Lucked out and took lessons from one of the best...Herb Ohta, Sr. You will love playing!